Do Sephardim bless before they kindle their Shabbat lights? I feel privileged to have a great collection of siddurim (prayerbooks). In fact I have not met a person that owns more siddurim that me in many, many years. Each one of them is important to me because they help shed light on various minhagim. I love to learn about different traditions and the halachic process that led to them. One of my favorite prayerbooks is the Siddur Ish Matzliach. It is a Mizrahi/Sephardic prayerbook that conforms to the customs of the near-east and Mediterranean (it refers to itself as “lifnei minhag haSephardim v’Edut haMizrach”). As this is the native nusach (style) of the Land of Israel, it is accepted widely outside of the Sephardic community and holds much weight in the Dati Leumi (Religious Zionist) circles. However, it should be noted that it goes to great lengths to document the nuances of the North African minhagim, being edited and checked under the tutelage of Rav Matzliach Mazzuz (of blessed memory; 1912-1971) who was a tzadik of the Minhag Djerba of Tunisia. When presented with that, those who are unfamiliar with the Sephardic customs can be thrown for a loop. This is strikingly different from what most of us are familiar with, no matter what our custom or where our community is in the world. Though this is the correct approach for the Sephardic minhag, it is not how most of us understand Shabbat lights if we have any connection to mainstream Judaism. Where do we start? First off, for those of you who studied along with me concerning the lighting of the Chanukah Lights it should come as no surprise to you that it is the Sephardic custom to use olive oil for Shabbat lights. This what the Temple menorah utilized for providing light by which the mitzvot of the Kadosh Kadoshim – the sanctuary containing The Holy of Holies, could be done by. Oils and fats are the standard type of fuel used for providing light, however in some parts of the Ashkenazi world such oils could not be found so out of necessity people began to utilize bees-wax candles. Even citing the Kaf haChaim (Rabbi Yaakov Chaim Sofer; 1870-1939) it is noted that this is the custom where olive oil is readily available, in the third part of the instructions. The reason given to us by The Ben Ish Chai (Rabbi Yosef Chaim of Baghdad; 1832-1909) for why we utilize lamps of olive oil is because they burn to produce a clean and steady light, which keeps the house from the harm of a “ruach ra / evil spirit” (Shana Rishon, Halachot Chanukah §12). Of course by this we don’t mean demons or malicious beings, we are talking about a negative spirit; meaning a bad mood, attitude or energy (think of the term “school spirit”). We brighten up the house to encourage shalom bayit – or peace in the home. Sitting in the dark we would be prone to negativity, confusion and mix-ups that lead to arguments. We should brighten up the house to brighten the mood. We use olive oil because of the steady light it provides that does not flicker; this also improves the mood of the home. The tradition of lighting with oil lamps thus also hints to us the type of person that we should be; ones whose light burns steady, without flair-ups or smoldering out. Flickering of lights is like fighting, instead we want to be a steady stream of light that is peaceful and temperate. Thus it is the tradition of Sephardim, and of many Chassidim who daven by the Nusach Sephard, to light with oil lights for Shabbat. In fact, myself living in a Chabad chassidic community I remember every family I knew to utilize oil or liquid parafin (kerosene) in keeping with this spirit of shalom bayit – peace in the home. Any of us who have ever seen people light candles in our local synagogues anywhere in the world know that the overwhelming custom is for a woman to light the candles. The process begins by lighting the candles, then gently putting the match down, waving over the candles three times to welcome in the light of the Sabbath day, then covering the eyes and lastly saying the blessings over the candles. This is the custom that is well known to all of us, no matter what our tradition is. It is what we see regularly practiced in normative Judaism. However, here the siddur changes the method around on us. Now as with the Chanukah lights, the practice we all know is the normative way as prescribed in the Ashkenazi (Eastern-European) tradition. Just as the Sephardic tradition differs in what we utilize to light, so too the mechanics change. However, unlike the tradition of the Chanukah lights where classical instructions are going to be silent regarding this and leave us to just accept that we have different approaches, this is going to stand out as a striking difference pointed out by siddurim. However, in all honestly, the majority of even Sephardic siddurim and halachic works are going to prescribe that we say the blessing after kindling the Shabbat lights. Now one might wonder, on what basis does this respectable siddur depart from this tradition? How can a universally known approach stand to be challenged? This simple answer is, this is the ikar ha-din; this is the letter of the law! One man, and one woman. that the blessing is recited after the lighting. after the lighting and recite the blessing. And here the Rema acknowledges that there are those who do not say a blessing over the lights, those who say it before, and those who say it after. Then he goes into presenting the Ashkenazi tradition of blessing after the kindling, and explaining why one should cover their eyes before blessing. Thus the Rema expounds on the different approaches, two of them being Sephardic and one of them Ashkenazi. But how do we know that this is the Sephardic method presented first, when the Maran doesn’t seem to know there is a difference so he doesn’t elaborate and the Rema doesn’t identify who holds by what? Second, and an ever better question, is why is the Rema concerned that we pass this mitzvah off as though we were blessing before the lighting? Notice, and I don’t say this to be condescending in any way, but in reality all one is doing by covering their eyes with their hands is pretending that they haven’t lit yet; why does one go out of their way to do this? The halacha is that we say a blessing before we do something, period. (the Rambam here is citing Talmud Pesachim 7b) This is known, this is accepted law and therefore to circumvent this fact one covers their eyes so that after they say the blessing and they uncover their eyes the lights are now there for them to enjoy. The Rambam, as a detailed writer, explains the line of thinking to us clearly as to why we should bless first. In paragraph 7, halacha 5 he gives us the sample of tzitzit, tefillin and sukkah. We say a blessing before we even engage in the acts of acknowledging them because the performance of them is ongoing. The act of doing it is not an act in and of itself, but engaging in it was the commandment therefore we say the blessing before. The only time we say the blessing after is if the act requires many steps and then we say the blessing last after all the steps are completed, but this is not one of those cases. When we Sephardim light for Shabbat we do so for utilitarian purposes, our oil lamps are in order to provide light for our homes throughout the Sabbath. They are dressed with finer wicks and oils than we would use the rest of the week so that they sustain and don’t need to be meddled with, but nonetheless they are just standard lamps and we use them for providing our light. 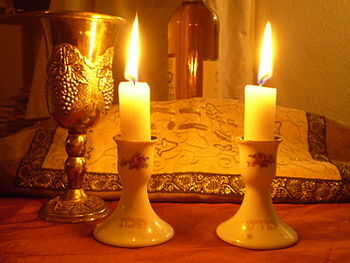 We light lamps shel Shabbat, meaning “for the Sabbath;” to enable us to do our sabbath duties. This is very different than lighting “Shabbat candles.” The candles in Ashekanzi tradition are a sign and symbol in and of themselves of the Sabbath. Whereas Sephardim just light up the house in order to have light to live, learn and dine by, so that the act is merely utilitarian; to Ashkenazim this is a ritual of the Shabbat customs that symbolizes the start of the sabbath. More precisely, with the saying of the blessing over the candles one symbolically takes on their observance of the Sabbath. The lighting is a mitzah to Ashkenazim, to us Sephhardim it is observing Shabbat that is the mitzvah and having a bright home helps us accomplish that but the candles are no mitzvah themselves. For this reason many different Sephardic siddurim and halachic works that deal with the welcoming of the Sabbath point out that it’s traditionally the custom of Sephardim to not say a blessing, or say a blessing before kindling the lights; the custom varies by community. But when stating this it is noted that this is in on account that Sephardim do not recognize the beginning of the Shabbat to commence with the saying of the blessing over the candles. Now lets back up to the statement made by the siddur’s explanation, regarding a man not having any “zichut / credit” when lighting. At first it looks to be the a simple phrase that tells us that candle lighting on Shabbat is not a virtue for a man, but for a woman. But it’s not saying this at all. What it is doing is giving us an example, of a person who takes in Shabbat early (as we can start enjoying Shabbat at any time we like), the custom is often to begin by kindling Shabbat lights to signify taking in the sabbath. However, here the siddur tells us that if one lights a lamp for Shabbat they are just lighting an oil lamp and nothing else. It is not a special demarcation of any sort. However, it calls us to look at the hidur mitzvah – the beauty, the detail of care to which we perform a mitzvah, as a symbol of our temperament and in pursuit of shalom bayit – peace in the home. However interesting the approach of the Siddur Ish Matzliach is, even more interesting is the number of Sephardic prayerbooks that do not hold by this halacha. Normally I would point to certain books like the Artscroll’s Nusach Sephard siddurim and decry them being a Sephardic approach to Ashkenazi tradition, stating that they are not Sephardi sidddurim in that that don’t follow Sephardic minhag. But even those sources that are firm in Sephardic minhag for ideological purposes tend to favor the blessing after the lighting. In fact, you will be hard pressed to find a halachic work of Sephardi origin that does not explain the kindling of Shabbat lights and follow the minhag of blessing last as prescribed by the Rema. Among the few who are going to champion the approach of the Shulchan Aruch to bless first before lighting is Maran Rabbi Ovediah Yosef, shelita (1920 – present; Rishon LeTzion, former Sephardic Chief Rabbi of Israel). What all this means when we walk through the steps of the halacha and history is we find that the Ashkenazim took on the tradition of lighting as a symbolic ritual act at some point along the way. In reality if you consider the way they lived, their candles were superfluous for use for light anyhow; most people used bonfires, stoves and fireplaces as their primary source of light anyhow. This was a way of them connecting to an age old tradition of bringing light, life and joy into the home. However, the tradition of lighting up the house for Shabbat has always remained a practical act in the Sephadic halachic approach. But our own custom of lighting Shabbat lights is adopted from Ashkenazim, and at this point in history even our lights are also merely symbolic because these lamps are not our primary source of light either; our electric lights are. Many rabbis do not make a big deal concerning when you say the blessing because in reality there is nothing wrong with follow the ritual lighting of Shabbat lights according to the custom of the Rema since this is a wholesale adoption of this ritual custom anyhow. We became accustomed to this tradition through their practice of it this way, so its okay for us to follow likewise. In fact though the way of Maran Yosef Karo and the Rambam is the ideal way, the only reason that people do not follow the ikar hadin – the letter of the law – is to not show contempt for ones elders, as we are not allowed to change the tradition that we are taught by our forebears. Some might wonder on what basis does Rabbi Ovedia Yosef and here the Ish Matzliach have the authority to go against hundreds of years of halachic tradition documented by Sephardic sages? Though it is true that some Sephardic communities have been following the tradition of lighting Shabbat lights for hundreds of years, others have only come to know this tradition since becoming reconnected to the greater streams of Judaism once their communities made aliyah to Israel. When adopted by newly established communities it seems only logical that they apply the law as-is. Secondly, there are many people who are newly religious and have only recently taken on mitzvot. For these people, there is no tradition they received regarding this from their parents so for them to adopt the actual custom in accordance to the rule of law poses no problems (people such as anusim, crypto Jews who have recently become religious Jews). In fact, it is best that we not frown upon such people because such individuals have the rare opportunity of applying the ikar hadin without the hangups of trampling a minhag. Even though the Sephardic tradition has been influenced by the other communities regarding this, there are certain halachic consequences that remain that one must be careful to keep in mind. Even if one decides to light with a blessing after in avoidance of doing a melacha after a blessing, you still have not taken upon the Sabbath and are therefore still able to engage in acts of work or preparation until one officially davens to bring in the sabbath once sundown comes. We do not begin with lights. Likewise we do not end with lights. For instance, Sephardim do not make havdalah before lighting Chanukah candles. As the lighting of Chanukah candles is a mitzvah and making havdalah is not so much so, one engages in the mitzvah first to not put off it fulfillment. And this is permissible because there is no consequences of breaking Shabbat because your havdalah does not break Shabbat any more than lighting begins Shabbat. This is true in all Sephardic communities. But we will deal with this more once its time for Chunukah again. 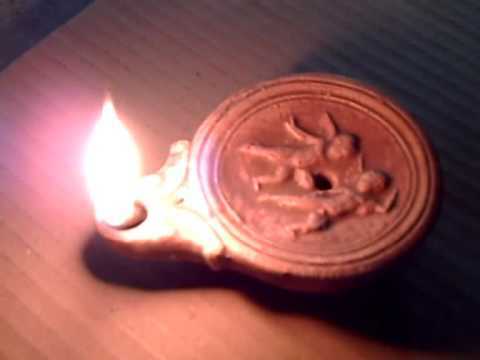 Though we might adopt traditions from among the different communities, and this is acceptable and has happened over time, the tradition of using oil lamps and the significance of them to us points to how even when we accustom ourselves to new ways we should still be mindful to perform our devotion according to our own style! Do Sephardim Really Light the Shamash Last? Do We Need A Menorah? One’s Minhag: Is it Something to be Dogmatic About? Lighting an oil Chanukah menorah (chanukiah) on top of the classic Sixth Street Bridge in Boyle Heights, East Los Angeles. Today I want us to explore some lessons in Jewish tradition regarding the Chanukah lights. We are going to be looking at our texts with a special eye on the Sephardic tradition. All the while explaining the development of shared Jewish tradition as we know it today. In order to be able appreciate the diversity of Jewish minhag (tradition) and the progression of halacha (Jewish law). As we come upon the holidays one naturally finds their mind considering all the rituals and customs associated with the celebrations. I find myself going over the liturgy and preparing the mitzvah items to make sure everything is in order. The liturgy, aside from additional prayers added to our daily davening, is pretty minimal; we have prayers for lighting of the Chanukah lights. There are three blessings, halalu (“these lights we kindle…”), some Sephardim and Chassidim add Yichud (a kabbalistic unification meditation) first and a song of praise such as Psalm 30 (a Psalm for the Dedication for the Temple) last, while most Ashkenazim add the liturgical poem Ma’oz Tzor (“Rock of Ages”). That’s it! Though there are striking differences between the minhagim of Askenazim and Sephardim, the commentary is generally the same for both communities. This is appropriate because these are the points with which both traditions agree. However, the finer details of the order of lighting the Chanukah lights is curiously not mentioned. It is these unique and often obscure customs that one would hope to have explained to them, not the points that are universally known. Because most religious people know how to light the Chanukah lights according to their community’s custom, people often tend to overlook the obvious here; it does not tell us what we should be using as a Chanukah light, what it should be lit with, or even who should do the lighting. It is in these specifics that the various communities make departure from one another. Understanding these details in necessary for functional reasons, a person who is unfamiliar with them might find themselves unable to actually perform this mitzvah. Most of us know the laws and the customs from being taught by our parents or community. Many are familiar with the way to perform the mitzvah through practice, yet very few through actual learning from the halachic sources. The instructions of the siddurim are not as barren to the observant person because they understand the terms and elements in light of their minhag; the words are loaded. Though one my be able to explain the ritual through interpreting the terms for someone as they understand them, implicit meanings do not provide a true reason nor a methodology. Furthermore, as these terms also hold different implied meaning by other communities this type of explanation cannot suffice. We need to provide a textual source, preferably a principal source so that the meaning is clear and free of jargon; then work from there. We will be exploring some of the halachic works, both Ashkenazi and Sephardi sources, from preferred texts that are widely accepted by their respective communities. Of course, we will start with the Shulchan Aruch (popularly known as The Code of Jewish Law). Not only is this the chiefest source in halacha (Jewish Law), it also has the benefit of presenting both Ashkenazi and Sephardi traditions. The Maran, Rabbi Yosef Karo hailing from the holy land begins by presenting the halacha, his views accepted by the Sephardi and Middle-Eastern communities. This is commented upon by the Rema, Rabbi Moshe Isserlis of Poland; whose glosses represent the Ashkenazi tradition. All these other sources will be examining thereafter will be be interpreting these laws for their own community as well, working our way from the 16th century to present day. All of our text will center around one specific chapter of the Shulchan Aruch, Orach Chaim, Chapter 673. Of course as the material coalesces the chapters mix together a bit, but ill try to keep on target. I will be translating these works, most of them for the first time into English, to help us along. Do we light a Menorah of oil or candles? Before we can even begin to discuss the mitzvah of the Chanukah lights we must begin with defining what a ner (a light) actually is. This might seem silly, because it is a common everyday word used in Jewish culture and the Hebrew language; its simply a candle in the vernacular. Though this meaning is correct, it is not actually appropriate for the age and region in which the Shulchan Aruch was written; from ancient times until the relatively recent times a ner meant an oil-lamp, a lantern. Only by starting from this understanding can we begin to make sense of the first clause. In an oil-lamp the oil is drawn up by a wick, the wick holds a flame while consuming the oil that is held in the reservoir of the lamp. However, we must understand that though “fats” implies oil, this is a generic term used for any liquid fuel. Though this may also refer to other forms of fats such as tallow, which can also be solidified around a wick to hold a flame in order to produce light as it is consumed. Logically, as we are lighting the mitzvah lights in order to commemorate and publicize the miracle of the lights Menorah of the Holy Temple which was sustained for eight days with one day’s supply of olive oil, it would seem appropriate for us to light with oil lamps. The Menorah only utilized oil-lamps, and the miracle concerned oil. For this reason we go out of our way to emphasize the significance of the oil, through eating oily foods and similar customs we regard the miracle of the Menorah oil. It has been the custom since the ancient world for Jews stretching from the near-east to Iberia (Spain) to light oil-lamps of fine olive oil. This is the assumed tradition of the Maran in the 16th century and is sustained as the Sephardic custom. The fact that this is the most fitting way of fulfilling the mitzvah and remembering the miracle of oil is attested to the by the Rema in his gloss to the Maran’s above statement. However, we need to take a careful look at the Maran’s statement again in order to understand on what basis is it appropriate for some to light candles. Though lighting an oil-lamp is the best way, the Maran tells us we can use any type of oil or wick to light as a Chanukah light even if it isn’t the choicest method. 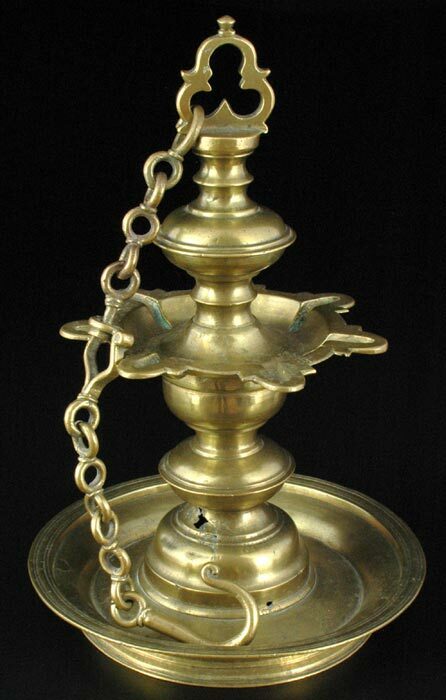 In order to make good use of an oil-lamp one must use fine oil, as a unrefined and dirty oil will separate, resulting in it smoking and smoldering; thus failing to produce a steady and sustaining light. Likewise, for a wick to hold a flame well it must be of fine quality and material; the choicest is fine, new cotton wicks. that burns pure and clean. The Rema appears to be of the opinion that we should use what ever we have at our disposable that is of the finest hidur (quality). If that means another type of oil, it will suffice; do your best. As oil is just not available in some places wax candles has had to suffice, but they do in-fact produce clean and steady light, though this is consequential. But this is where the similarities end, the mitzvot are not the same. On Shabbat we utilize only the best we have in honor of the sabbath. The finest of all things are normally set aside for the sabbath use, such as oil; and we do not make ordinary re-use items but instead use fresh materials, like wicks. However, this is not true for the Chanukah lights. We can reuse old wicks, there is no requirement that they be replaced everyday. And the oils used for the Chanukah lights does not need to be of the finest quality, we can even use left over oil from the nights before if some remains to light the next night. Though ordinarily on the sabbath we want the best wicks and cleanest oil for a practical purpose. We need a light that we will stay lit so that we can do our sabbath activities that night and maybe even the next day, we want a wick that will last and a oil that gives us more than just smoke before going out. We need a fine wick that will work, one we will not be tempted to adjust on Shabbat because it tends to extinguish itself. Keep in mind we are in an age where this is the primary source of light, lanterns of candles or oil. The only real concern we should have is that we supply enough fuel in order for the lights to stay lit for the required amount of time to fulfill the mitzvah. The ideal burning time is one-and-half hours. or to examine [the intensity] the light. We cannot make any use of the Chanukah lights, we should not even examine the elements of the Chanukah rituals by means of it’s light to see if it is crooked, distorted or twisted (ma’ot); or as others more simple suggest, we cannot check or count money, as ma’ot (ma’ah singular) are small coins in Talmudic terminology. Either way, we are not allowed to make personal nor sacred use of the Chanukah lights for any reason. Not even for the most lofty of purpose of such as studying Torah. As we will come to see, the difference between Shabbat lights and Chanukah lights is that whereas we use the light to enable us to do our Shabbat mitzvot (we use the light to make Shabbat in our home), during this holiday the lights are the mitzvah (our only requirement is to kindle, nothing more). In paragraph one of the Shulchan Aruch the Maran acknowledges that there are others who do not hold by this opinion, being lenient concerning sacred use (though he doesn’t identify anyone). However, he goes on to express that it is not the custom of his community to be lenient in this matter, stating that the “proper minhag” (presumably meaning that of the Sephardic community) is to instead light a ner nosef; an additional light. He states the purpose of this additional light is so that one does not make use of the Chanukah lights, instead providing them another light. And by being set apart from the Chanukah lights, one is not prone to make use of the sacred lights but instead use this light. He then says this additional light is lit last. The Rema takes a personal tone, saying that in region from which he is writing (he is in Poland) it is the custom not to add an additional light. Instead one uses the Shamash for this purpose of providing light. The Shamash is also used to kindle the Chanukah lights. Logically, if you light the festival lights with the Shamash then it must be lit first and not last. 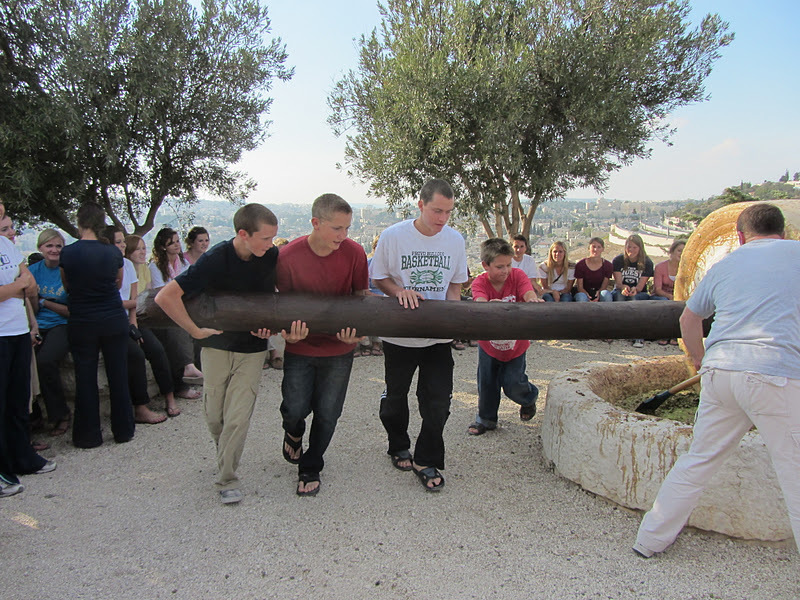 By virtue the word shamash means “the servant,” suggesting that it is used in service of kindling the other lights. This is our first mention of the Shamash, it’s purpose is suggested by the name that is ascribed to it. Though the idea that it is lit first is not yet explicitly stated here. In this line the custom of Ashkenazim to light the Chanukah lights with the Shamash is documented for us here in the 16th century by the Rema. It also provides us from where the custom of placing the Shamash light right next to the Chanukah lights is derived. The word preceding is also generally understood figuratively, according in its literary form as “azal” meaning to place close by or near to something, instead of “eh’zel” (same spelling, different pronunciation) which means to delegate and utilize. Whereas, the Maran says a light should be a bit away, this figurative understanding of the Rema’s words suggests “close by” instead. So now not only do we have two varying minhagim relating to the type of lights, Askenazim lighing candles and Sephardim lighting oil lamps, but we also have two different types of auxiliary lights. Askenazim lighting it first and the Sephardim lighting it last. The Rema will also go on to tell us that this auxiliary light should be longer than (יותר ארוך) than the rest of the lights so that one makes use of it. 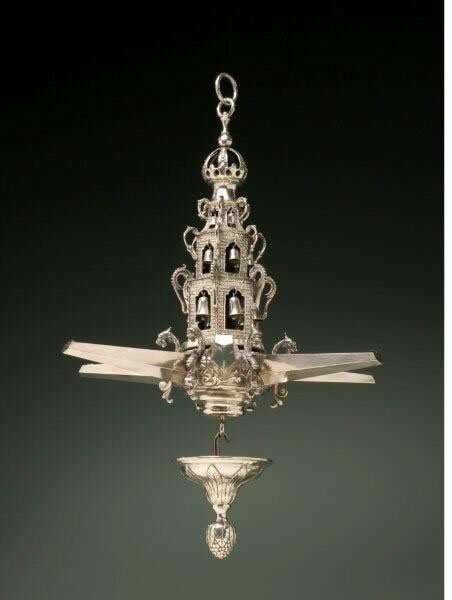 Though this explicitly means longer-lasting, not taller or higher, it is the custom of many Askenazim to also place this light above the mitzvah lights, on a single candelabrum with one branch rising higher for this auxiliary light to be placed upon. For practical reason this is helpful, to make better use of the light we should place it higher. It is the universal custom to not place the mitzvah lights too high so that we are not tempted to make ordinary use of them, but any additional lamps in the home are placed at a good and sufficient height to better illuminate the room. Though this does not need to apply to the Shamash, it is still appropriate and helpful. All of this might seem confusing to some, virtually then entire Jewish world only knows the custom one way. Even the gentile world knows the symbol of the menorah through the lighting of the chanukiah – the 9 branched (8 arms, 1 Shamash) candelabrum that is lit for Chanukah. From the White House to your local shopping center you will find menorah lighting ceremonies to celebrate the holiday. We think of candles being lit. It seems self explanatory, you get a candle and you light the rest of them with it. If you had to pick which one was gonna to single out, it’s obviously going to be the Shamash. Now lets try considering the Sephardic custom to light the Shamash last, and try to work through the mechanics of that with candles. And here we have a really big problem. That extra-candle is all good and well for extra light, but now it’s really close to the rest of the mitzvah lights so we are now prone to use them by using it. But is something that should be more drastically obvious to us to struggle with. This extra light is not even used for lighting the other candles so its superfluous; it doesn’t serve any real purpose. It doesn’t make any sense. Furthermore, it would seem frustrating because now we don’t know what we are supposed to be lighting the rest of the candles with. As most of American Jewry is Eastern European (Ashkenazi) their custom is the most prevalent in our society. We understand this method. Being in America, it is true that olive oil in this day and age is not hard to acquire. And it is relatively affordable, though not necessarily inexpensive. However, candles are very inexpensive and we all know how to use them. 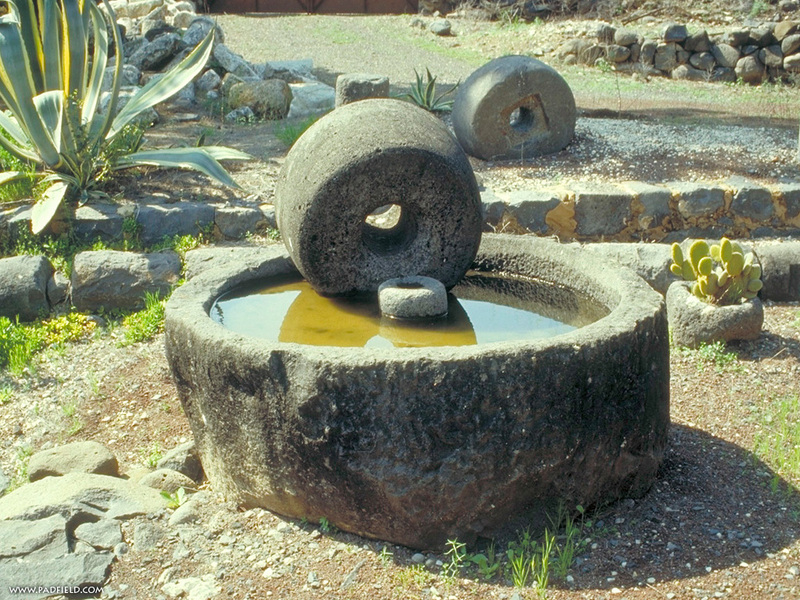 If olive oil was as common to America as it is in the Mediterranean and middle-east, we would most likely make use of oil lamps for economical reasons instead. We do not need the finest olive oil to light. Nor need to have a special menorah to light Chanukah lights upon. All that is required is that we light the right amount of lights for the day and the Shamash. In the east it is the custom to use individual oil-lamps without placing them on a candelabrum. One does not even need separate lamps, one can use a single reservoir lamp with one wick for each night. Likewise, it is permissible for us to just light the right amount candles without use of a menorah. All that is required is we keep the ner mitzvot at the same height. This is true in any community. Sure there are some Askenazim that do make use of olive oil for Chanukah lights. Sometimes the oil-lamps are placed in the form of a menorah, but one needs to be careful not to confuse the two. In relations to what we have already discussed, we cannot make use of the lights for any purpose; whereas the Menorah of the Tabernacle and the Second Temple period was utilized explicitly for lighting inside the sanctuary. The Menorah of the Temple had seven branches for oil-lamps and were regularly refilled with oil. At the center was an offset ner meharav (the western light) thats was perpetually kept lit, and it was utilized to relight the other lamps. Though it is the stringent custom of some to relight Chanukah candles that are accidentally extinguished, it is also the stringency of such communities to not allow kindling one light off another: This is the sustained Ashkenazi opinion, despite being allowed by the Maran (674:1). The opinions of the Rema and subsequent Ashekenazi poskim are blatantly presented as stringencies. Naturally if one was using candles this would be reasonable as you want to use as much of the candle as possible and not waste it, and relighting is easy as one has an available Shamash with which to do so. Now for a moment I need us to step back and consider this for a second. All the commentaries up until now have relayed the information related the laws of Chanukah lights in a specific order. Naturally since all these works are themselves are commentaries and pretty much the “Cliff’s Notes” of the Shulchan Aruch, we expect the information to flow in accordance with that. The Rema who first comments on the Shulchan Aruch even keeps in complete step with the order of the Maran. In fact the Maran himself is following an order and line of thought already set up by the Tur (in the late 13th to early 14th century). But here Rabbi Ganzfried gets ahead of himself and starts interpreting the text broadly. Surely he knows whats coming up in the next chapter by the Maran so he has to make a pre-emptive statement; be stringent, do not light one light off of another light, but instead use the Shamash or another light. Though this should only really apply to relighting candles (which the verses immediately before this concern themselves with), he is making a blanket statement about lighting and relighting in one solid swoop. I say “pre-emptively” because the next whole chapter of the Shulchan Aruch is going to be the Maran explicitly telling us that we are permitted to light one light from another. He says that we are actually even allowed to light one light right from the other without having a candle in between them to light with. However, he admonishes us that one is not allowed to light with an ordinary light; an ordinary candle (ner shel chol) / a weekday light. Though he admits some permit this, as long as there is not the fear that the light will go out in between lighting the Chanukah light with the ordinary candle (ha-ner shel chol). The Rema and Ashkenazi tradition will disagree with this. The reason that is given to us by the Rema is based on a true assumption; only one of the candles is actually a mitzvah light, the one light for that specific night. The rest to the right of the light are to aggrandize the mitzvah, but in reality only one of the candles is necessary. We all know the story of how we came up with the lighting in this fashion, it was a debate of lighting one candle, or changing the order to correspond to 8 days in either by adding or subtracting lighting. In the end the tradition implemented by the Rabbis of the Talmud was that of adding lights so that we would come to an honored climax. (Talmud Shabbat 21b) On account of this it is felt that the other lights are less holy, because in essence we only really need one candle per day. If we were to light the first light then light the additional lights off of it, we are using the light of the mitzvah for something that is not necessary for a mitzvah, we are cheapening the mitzvah light by using it for a lesser act. But like I said, I want to deal with only one chapter of the Code (though the text and translation for the section cited will be listed in the footnotes below), so I cannot go into more detail at this time for the sake of time. But there are some details we have to cover in order to understand why the next work also jumps the gun as well as. First off, the reason that the Maran seems concerned that we do not take any ordinary object and take fire for the Chanukah lights for it is also in order to not appear to cheapen the mitzvah as well. 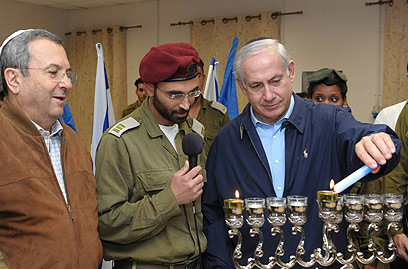 He thinks its better practice to light one Chanukah light directly from another if necessary. First off there is a subtle assumption made, that by lighting up another candle from a sacred light in order to light another one thereby designates that item for sacred use and it should not be treated like an ordinary item from that point on. The other cause for concern seems to be that if one uses an intermediary candle, then one must be sure that the light is not likely to go out before completing the process of transferring the flame. If there is such a risk (like heavy wind for instance) attempting a transferring of the light for kindling is not permissible. We want it to be clear we only use the flame for a mitzvah and not for personal use in the interim of lighting, which would appear to be the case if the light went out before we actually lit another candle. Nachon, are we following along so far? It seems the Maran is making a stringency saying we shouldn’t use an intermediary candle, though some permit this. Though a reason is provided above by the Rema, concerning the lesser “importance” of the other lights aside from the single light intended for that day; this will not be the final halacha for even Ashkenazim. In the end it is going to be tempered by generations of rabbis who are going to attest to the fact that because the other lights of the Chanukah count are set aside for a sacred use, they also have holiness imparted to them. They must be treated sacredly. By the time of Rabbi Ganzfied with his Kitzur the halacha is going to be established as such, and signified by us keeping all the mitzvah lights at the same height to signify they are for the mitzvah, and the Shamash we raise a little bit higher. This is the custom in all communities. In the minds of many people the halachic process ends at this point. The halachic reasons presented up to now are sensible to us. Here we see the evolution of a halachic processes taking place in how we perform this mitzvah, it is natural for many to think that we should follow the rulings that is most contemporary; in this case the urgings of our Ashkenazi rabbis such as the honorable Rabbi Ganzfried. Some also see this as keeping in step with progress, we are moving from oil lamps to standard candles so the halacha shifts. However, Rabbi Ganzfried’s positions represent the Ashkenazi tradition in as much as he follows the ruling of the Rema. And furthermore, there is a voices even more contemporary that shares the Sephardi position. a completed [also. elegant] mitzvah. in size, appearance and kind. that it is not part of the Chanukah lights. for [lighting] an ordinary item. First off, before I get any further I must note that in the paragraph before this one (paragraph 12) the Ben Ish Chai who is a only 25 years the junior to Rabbi Ganzfried attests that we in the “orient” and near-eastern lands still use olive oil, he says of both Chanukah and Shabbat lights; only differences really is the quality of the wicks. He begins this by quoting the already discussed words of the Rema himself, “shemen zait mitzvah min ha’muvchar / olive oil is the mitzvah done to perfection.” But this shouldn’t be anything shocking to us, because this is also agreed upon in the Kitzur (139:4). But instead of immediately going into making the argument and mechanics for using wax like the Kitzur does, here the Ben Ish Chai is going to say that its okay to use candles without making an argument for it. But he will present us with certain guidelines concerning this advancement. If we are going to use oil, then we use all the lights oil. If we use wax then all of the lights should be wax. This is because the lighting is one complete mitzvah. We need to keep the candles not only level with each other, but of the same kind so that it is obvious and apparent we are completing one whole mitzvah with these lights. Now the Shamash should be distinct so it can be different from the rest of the lights. It seems to be suggested that it can not just be set aside, but be a strange candle or light that is different from the rest. We should raise it a little bit higher, or set it aside from the rest. But what about lighting and relighting? He says we should not light weekday or ordinary lights from the sacred Chanukah lights, but from the additional light it is permissible. Sacred lights sacred, ordinary lights ordinary. But then he throws a zinger at us here. The stringent of the Sephardic custom allows one to light with an even additional candle yet. This is the light that we utilize for lighting the initial lights (which we light before we recite the blessings and light the number of lights for the day). We can take this third-party candle and use it to light; then put it out. If we relight, we can use this third-party candle again. Yes, we can even relight from the other Chanukah lights for another Chanukah light. But we should only light sacred with sacred, and non-sacred with non-sacred. It also spells it out for us plainly. We can use any temporary item in order to light or relight the candles with, what ever is necessary in order to perform the mitzvah. Though we are not allowed to make use of the fire or illumination for any other purpose, even for fulfilling another mitzvah; but for the mitzvah of lighting or relighting the Chanukah lights we may temporarily use that light, or use a temporary item in order to accomplish that. It can be another match, or another candle. Generally we use another candle that is able to aid us with this, then when we are done using it we extinguish it, it does not need to be kept contentiously burning like the rest of the lights. And here, as late as the 20th century despite innovations in halachic approach and even the instruments we utilize as Chanukah lights; the tradition of the Maran that was present in the Shulchan Aruch still holds true for Sephardic and Middle-eastern Jews up until the present day, at the urging of rabbis of our own tradition. After Rabbi Ovediah Yosef left office as Chief Sephardic Rabbi of Tel Aviv-Yaffo, Rabbi Chaim David haLevi took the position, in which he served for over 25 years. He was a widely respected rabbi who was known for his temperance, wisdom, modernity and keen insight. His Kitzur Mekor Chaim (named after the larger 5 volume halachic work, the Mekor Chaim haLevi, which would also become his nickname) became a standard text used in the Israeli religious education system and in Religious Zionists yeshivot. He is uncompromisingly Sephardi in tradition, but is bold in bridging the gap between the customs of the Jews of the East Orient and those of Eastern Europe by even including Ashkenazi halacha in his conclusions when appropriate. It’s this balance that made it a widely accepted work. There is one interesting feature though in this statement. He would interestingly seem to not stand behind the already established Sephardi customs of permitting only the head of the house to kindle the Chanukah lights, appearing to side with the Ashkenazi tradition that each person old enough has to light their own Chanukiah. Though one might assume that his approach of balancing both traditions left him with a choice regarding the application of the clause referring to who is obligated to light the Chanukah lights. Some have incorrectly assumed that he has sided with the Ashkenazi approach, as this custom is choicest and more logical. They disregard various passages from the Maran himself, were he twice he suggests to us that one who is old enough to learn is obligated to light too. His opinion seems to be that everyone should light, nonetheless we must keep in mind that the obligation of lighting is performed by the head of the household only in the Sephardic tradition. so that they can be educated in the mitzvot. they can perform a small mitzvah. and it is proper to do so. and olive oil is a mitzvah done to perfection. wax for a pure and clean light. The Kitzur Mekor Chaim is an ideal example of modern scholarship, presenting halachic opinions necessary for our current age. It brings down law without disregarding the halacic opinions of those who came before us. Now if we want to understand our minhag, that requires more than just a passing reference in a single volume. That requires an honest and deeper look at the halachic process. Once we do that, it is very apparent that we are actually a lot more alike than we are different. סעיף ב — כמה נרות מדליק? בלילה הראשון מליק אחד. מכאן ואילך מוסיף והולך, אחד בכל לילה, עד שבליל האחרון יהיו שמונה. ואפילו אם רבים בני הבית, לא ידליקו יותר. MARAN: How many lights should one light? On the first night light one. And then continue on adding additional; one every night until he ends with eight. And even if there are many more members of the household, one should not add more. הגה: ויש אומרים דכל אחד מבני הבית ידליק (רמב”ם), וכן המנהג פשוט. ויזהרו ליתן כל אחד ואחד נרותיו במקום מיוחד, כדי שיהא היכר כמה נרות מדליקין. REMA: But there are those who say that each member of the house should light; (Rambam) and therefore it is the widespread custom. One should be careful to place their lights in their own separate space, so that one can recognize how many lights they have lit. סעיף ג – מי שאומר בקטן שהגיע לחינוך מותר. MARAN: There are those who say that small children old enough to be educated are permitted [to light]. הגה: ולדידן דכל אחד מבני הבית מדליק בפ”ע קטן שהגיע לחינוך צריך להדליק ג”כ. REMA: And for us, each member of the household [is obligated to] light. There are those who say even a small child that is old enough to be educated must light. MARAN: A small child that is old enough to be educated must light.